I decided to pursue my beauty career at the age of 31, after pondering over it for many years. I researched high and low to find a place to study which would give me a high level of training as well as flexibility for my 2 young children. 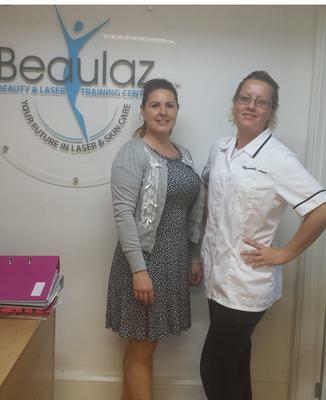 I visited many Beauty Schools and Colleges but Beaulaz stood out from day one for their friendly welcome, their excellent teaching staff and their professionalism. My tutor, Sarah, was one in a million. She taught me so well that I managed to get 100% in some of my exams! She was always there to give me advice and guide me and taught me to a very high standard. I travel 80 miles to get to the school, but its so worth it and having just completed my NVQ Level 2, I cannot wait to start my Level 3 and 4 with Beaulaz. I've got the study-bug now and I actually felt slightly sad completing my Level 2 as I enjoyed it so much! It makes me want to start my Level 3 as soon as I can. I feel completely confident to start my own home based salon now and this is all thanks to the wonderful team at Beaulaz, who made my 16 weeks very enjoyable and have sent me out industry-ready. Hounslow Beauty college great and recommendable. I think Sarah is a star, she is very useful. She has helped me throughout the course from A – Z. I felt very comfortable while I was doing this course. She helped me put together my portfolio – as I am 50 I found this challenging. I decided that I will definitely complete a Level 3 course because I want to set up my own business. I want to do this course with Sarah. She is really good. The other girls in the course were great, we helped each other as we all have the same goal. We completed the course a week before we expected. My only complaint is that there is nowhere for me to hang my coats and luggage. Where can they expect me to hang my expensive coats in the winter. I hope that when I return their will be a facility for this. I have seen that the college is well looked after. Along the course I have learnt some special skills, including manicures, pedicures and facials. I feel prepared to open my own salon as we are taught about health and safety too. I have learnt a lot. I believe the air conditioning facilities need to be improved too. I would definitely recommend the college to others – this is a non pressured environment. I felt very comfortable throughout. I feel this is very important, and because of this I was able to achieve a lot. I found the manager in Colaz, Jessica, to be welcoming and ticks all the boxes. I found her efficient and pleasant. Since coming to the Hounslow branch she made me feel very welcoming. I studied level 2 with Beaulaz. I had already done this course at another college and they didn't help me so had never finished my qualification. 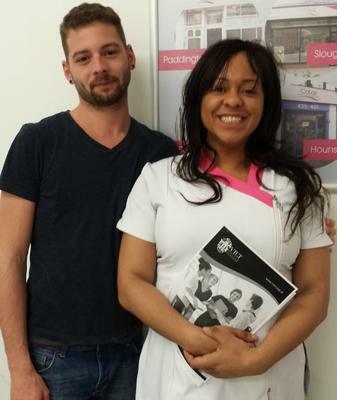 From the start they were encouraging, helpful and assured me they have a 100% pass rate. They were really flexible about payments which was great as I couldn't afford to pay in one go. My tutor was fantastic, she really knew her stuff and was always happy to help and answer questions. She often stayed behind to explain things I needed help with and supply any extra reading material I needed. She was always just an email away so even with the assignments if I got stuck I dropped her an email and she guided me with where I could find materiel that would help me. I thought this would have been difficult because I am a man; the idea of coming into the beauty course was so daunting. However I was glad that everyone made me feel completely comfortable. The teacher was so welcoming and made me feel at ease. Sarah is wonderful. I was never treated like I was different from anyone else. And I enjoyed the course so much. I wanted to build up my skill set; I already had a massage qualification before I joined Beaulaz. This has given me the opportunity to broaden my qualifications and offer a number of treatments that I couldn't have done without Beaulaz. This is a great course covered everything I need. Has given me all the tools to start up my own business, I feel that this is a new life skill which I can take with me anywhere in the world. And I am confident that this will be a great business path to follow. This fits completely around my busy lifestyle; I am a single mother of three so I am grateful that I can bag an amazing qualification that fit in line with my beauty passion and interest. I will definitely be progressing on to cover the higher NVQ levels. I eventually want this qualification to support my sisters’ current business. She is a tattoo artist so if I can gain a laser qualification I can eventually become a professional enabled to conduct tattoo removal. 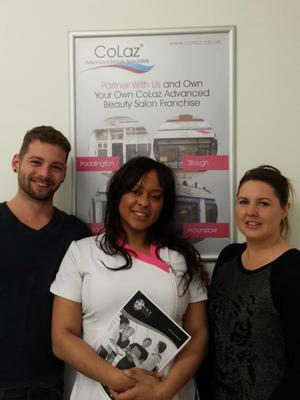 Hounslow Level 2 Beauty Therapy Course. Sarah my tutor is very helpful, especially when you need guidance for practical work. One thing I like about her is that she is always approachable. I see a very friendly side to her so I’m not afraid to ask several questions. We do get given enough time to do both the theory side and the practical side to the course. I enjoy the practical element mostly. Although I have not started my assessments I am finding it difficult to find models for me to conduct practical’s on. Initially I was looking to start a Beauty course, I never thought of this college. It took me a month to finally find a convenient college. I just found that it was so difficult for me to even come across Beaulaz online. Even passing by I was not aware that there was a training centre located right on my door step. After realising this I was really looking forward to coming to Beaulaz. Getting the flexibility at work was difficult, but I found Halima to be really helpful with giving me advice. Yet the courses are not flexible enough for how my work shifts work. On top of this, I was initially told that it would be a 16 week but I was now told it was 20 weeks. I never realised that I would be providing my own models for each and every treatment and assessment. For each treatment you have to provide a completely new model. Courses are not complete until all assessments are so the course can prolong even longer. As a whole I do find that everyone is friendly, and I get along with all my class mates too. The issue with providing models causes a hindrance. Best Beauty college in the UK doing level 2 and 3. I am so happy with my Level 2 class and I will be returning to complete my Level 3 and my Level 4 qualifications with Beaulaz. I want to eventually open my own beauty salon and I feel like this is the perfect place to study. Hotels around the areas are so cheap and affordable. If anyone is travelling from far like me it is still very worthwhile. I come from Pontefract which is nearby to Leeds. I stayed at the Furnival Lodge which is just a 2 minute walk from the college. There are plenty of shops around and it was a really clean place. I found Beaulaz clean and hygienic too. If you have any questions they always give you an answer and they are very helpful. They are so polite and always offer me a drink too. This is the best company for you if you want have your own business. I have checked around for colleges all over the UK but preferred Beaulaz. The parking here is free and is conveniently right near the back of the building. Everything I wanted to learn was covered in this course. I feel very confident about doing treatments and even ready to go ahead and start a job right now. It is so easy to learn here and Kay and Sarah were very helpful. Everything in this college is perfect. If they start offering more courses here at Beaulaz, I want to come back to do it. I learnt a lot here, even with things like waxing which I thought would be difficult. I thought it would pose issues like taking off the clients’ skin. However it did not. There are so many little facts that you get to learn along the way. There is so much to learn here; even the tutor told me facts. Like 80% of people think that eyelashes never grow back but really in fact they do. All the tutors are perfect, the receptionist offered to be my model when I needed it. Everyone even the office staff are nice and friendly.